Classic 6 panel cap with tricolore colours banded onto the peak. 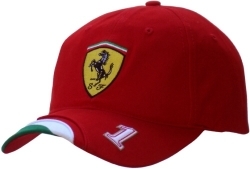 Ferrari racing shield embroidered on front, No 1 on peak, Ferrari on back strap adjuster and shield embossed metal closure. 1996 Michael Schumacher Dekra Cap. THESE OLDER CAPS HAVE RAPIDLY BECOME COLLECTORS ITEMS! LIMITED AVAILABILITY !!! 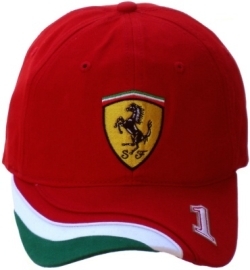 Cap made of 65% Polyester and 35 % cotton with Scuderia Ferrari Logo with a symbolic representation of the Marlboro logo on the sides, Dekra logo on the front, Michael's signature embroidered on the peak, FIA Formula 1 World Championship logo on the left rear and Michael's personal Speedline logo on the center rear. One size fits most with adjustment strap. Free shipping to any destination in the world ! This is of course official Michael Schumacher Merchandise.